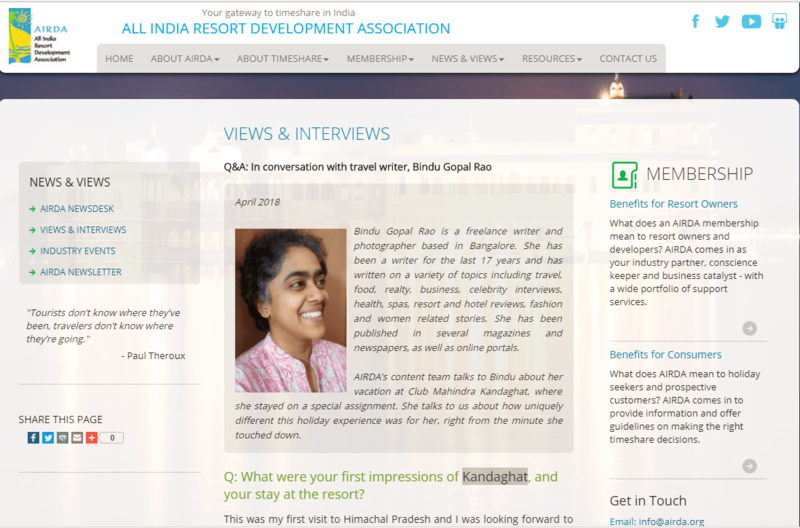 I recently visited Club Mahindra Kandagat and was approached by the All India Resort Development Association for an interview after reading my story. This was my first visit to Himachal Pradesh and I was looking forward to seeing a new state as I believe each state in India has its own unique calling. I was fortunate that I was at Kandaghat which is an offbeat destination and something that I personally relate to as a traveler. The resort itself is nestled amidst the lower Himalayan range and it almost feels like it is in the midst of a hill range. Just like the location, the activities here have a lot to do with nature like treks and more. I however enjoyed the bird watching here as I am a keen birder and was lucky to spot the red billed blue magpie for the first time. 2/ How well does the architecture of the resort blend with the visual harmony of the location . . . the setting? The resort is designed aesthetically and looks like a palace with a nice white facade. Set within a landscape of blooming flowers, the resort never feels intrusive and blends with its surroundings quite seamlessly. In fact the myriad hued flowers and large variety of roses (in almost all colours) are a big attraction here. 3/ What was your suite / room like, in terms of interiors, furniture, comfort levels and other frills? I stayed in a large room that was comfortably furnished and had a living space contagiously with the bed. A small kitchenette was also part of the room and a large attached bathroom and balcony ensured I had lot of space. 4/ What was the food like at the restaurant/s? Did you try room service? Was it prompt and efficient? 5/ What was the level of service like at the reception / help desk, housekeeping, room service, etc. The service standards of the hotel are impeccable and on par with any reputed hospitality establishment. All my needs were taken care of and on time. The hotel has a complete play area for kids as well as an activity room. This apart they have activities like paint ball and Himachal Pradesh’s longest zip line too. There is a guided trek that is not very easy to do so be prepared with the right gear. There are also bird watching and nature walks that are done. This apart, trips to Shimla can be organized at an additional cost.